The Israeli leader’s comments follow a confrontational last couple days. On Saturday, five rockets were fired from Gaza at Israel, with the IDF responding by hitting Hamas military posts in Gaza with tank fire, according to the IDF Twitter feed. One day prior, the IDF posted to Twitter that tens of thousands of “violent rioters” had come to the Gaza border with Israel. “40,000 violent rioters in Gaza, some armed with knives, explosives, and grenades, are attempting to breach Israel’s border and reach Israeli families on the other side of the fence. If our soldiers weren’t there, they could,” tweeted the IDF account. Among the incidents, two children were sent to invade Israel armed. “Hamas terrorists have sent this morning these two 8 year old children to cross into Israel with a knife. The IDF has returned them safely to Gaza. Where are these kids’ parents? Why did they collude with Hamas?” tweeted Israeli Prime Minister’s Office Spokesman Ofir Gendelman. 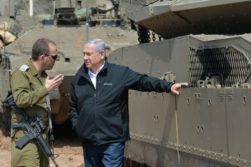 Netanyahu’s warning that the increased Israeli military deployment would remain in the Gaza area come after Netanyahu himself on Saturday thanked the Israeli forces for achieving quiet following the recent uptick in hostilities. The Israeli Premier expressed “appreciation to Southern Command ground forces, the Air Force and the other security branches for their resolute activity and massive deployment which helped bring about the calm,” according to a press release from Netanyahu’s office. But that was Saturday, and by Sunday a full-scale military campaign was back on the table.